Though they affect human character and approach to life, the Faculties and their disposition are elements deep within the psyche and do not explain the minutiae of human behaviour or the traits of the individual. Yeats was not particularly curious about such matters, seeking rather certain universal abstractions or symbols through which to understand humanity: in his psychology, as in his drama, his concern is to explore the underlying psyche and its forces rather than to present verisimilitude on stage in the recognisable traits of believable characters. Will ‘or normal ego’ (AV B 83) is described, in A Vision A, as ‘feeling that has not become desire because there is no object to desire; a bias . . . an energy . . . the first matter of a certain personality-choice’ (AV A 14-15) and, in the words of A Vision B, it ‘has neither emotion, morality nor intellectual interest, but knows how things are done, how windows open and shut, how roads are crossed, everything that we call utility. It seeks its own continuance’ (AV B 83), and is an instinct for life and survival. Mask is ‘the image of what we wish to become, or of that to which we give our reverence’ (AV A 15), or the ‘object of desire or idea of the good’ (AV B 83), and it only has meaning if there is the desire of the Will. Creative Mind is consciously constructive intellect with memory from before birth of ideal or Platonic forms; it potentially ‘contains all the universals’ (AV B 86) and implicitly seeks to understand through generalisation but needs materials with which to work and create its order, so that if it were isolated from the other Faculties it would be indiscriminate in its impressions since lacking direction. Body of Fate is the internal representation of ‘the physical and mental environment, the changing human body, the stream of Phenomena as this affects a particular individual, all that is forced upon us from without, Time as it affects sensation’ (AV A 15); it has greater independent meaning since it is the personal, constituent fragment of the general reality, and ‘the visible world is the sum of the Bodies of Fate of all living things’ (AV A 158). Yeats also encapsulates the Faculties elsewhere as ‘Thought and will . . . effort and attainment’ (AV B 135) and ‘Thought and inclination, fact and object of desire’ (AV B 183), so that one can roughly equate Creative Mind with thought, Will with inclination or bias, Mask with what we strive for or desire, and Body of Fate with fact or attainment. However the Faculties never exist in isolation, and for this reason the descriptions in A Vision B hardly treat of them separately, although the brief descriptions in A Vision A may help the reader to grasp their function and nature more clearly. In particular the two Oppositions, which always face each other across the diameter of the Wheel, can only be considered together, since Will must be understood through its relation to Mask and Creative Mind in relation to Body of Fate. The first pair represents the urge to individuation, the need to assert personal destiny, the second the urge to understand, to identify with the other, to accept fact and fate. The appetent Faculty of each pair has no end of action without the target Faculty, there is no movement and no life. Similarly, without the conflict between the two pairs, their Discord, there is no consciousness, since ‘things that are of one kind are unconscious’ (AV B 82), so that when the Will is absorbed in the Creative Mind at Phase 1 and vice versa at Phase 15, the incarnations are ideal, such that consciousness is almost suspended in a dream-like trance (AV B 94; 135; 183). The explanation of A Vision A is rather clearer than that of the later version, since it moves through a step by step reduction, rather than jumping immediately to the more useful schemes. The four Faculties are introduced as two pairs of Opposites: that of Will and Destiny (later Mask), and that of Mind (Creative Mind) and Fate (Body of Fate); each pair forms a gyre or cone, with the motive, personal forces, Will and Mind, at the cones’ point, and the object of pursuit, the ‘utmost range possible’ to the motive, Destiny and Fate, at the broad end. Creative Mind and Body of Fate are fundamentally Solar and Primary in nature, with Creative Mind the active, Solar Faculty, and Body of Fate the impersonal, Solar focus; Will and Mask are fundamentally Lunar and Antithetical in nature, Will the active, Lunar Faculty and Mask its target (see the page on the Tinctures). Fixed at the apex and the base of each cone respectively, each pair is always in fixed relation to the other (opposition when expressed in terms of the Wheel). A rejected draft version probably expresses this most succinctly: ‘Within the cones of Faculties, the pairs of opposites, or Faculties whirl in opposite directions, Will perpetually facing Mask, Creative Mind perpetually facing Body of Fate. . . . Will & Mask are Antithetical, Creative Mind & Body of Fate primary’. At the same time either cone moves in exact, but opposite, relation to each other, such that when the Faculties’ cones are expressed diagrammatically on the page in two dimensions as lines placed on ‘triangles’ (designating their ‘positions’ relative to the Tinctures’ strength within the cones), the pairings appear to change from those of Oppositions (Will: Mask and Creative Mind: Body of Fate) to those of major Discords (Will: Creative Mind, the two active, or appetent forces, and Mask: Body of Fate, the two goals or target areas). 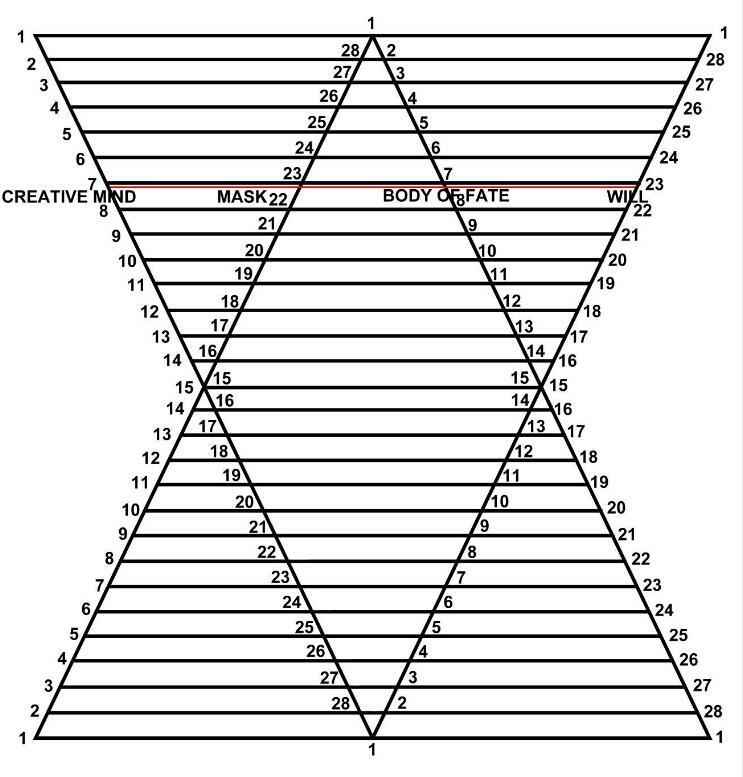 On the double cone where the external sides of the two cones are used, it is the two conscious Faculties (Will & Creative Mind) and the two unconscious Faculties (Mask & Body of Fate) which therefore appear to move as pairs along the same cone, and it is as such that they are treated when they are introduced in AV B (viz. AV B 75ff). Although it is slightly inaccurate to place Phase 28 on the same base line as Phase 1, which should be Phase 1 alone on either side, the error of detail is necessary to indicate the direction of motion of the Will, starting at the bottom left (North) and moving towards Phase 15 (South), then returning to North. In either version of the diagram it is clear that the pairs of Faculties must remain on their respective cones in order to progress through the cycle of their changes, and it is therefore preferable to emphasise what the two pairs of Discords have in common. 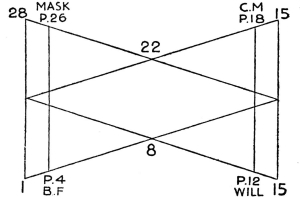 In many ways the step by step reduction of AV A, showing the true pairs of Opposite Faculties as cones gives a fuller understanding and is clearer than AV B’s explanation which expresses these ideas such that they may appear rather arbitrary rules. The progressive substitutions involved can be, however, initially of little more help than the later approach and Yeats himself seems to have thought that his later version was a clearer exposition of the dance of the four Faculties, though it may obscure some of the underlying rationale. Because the disposition of the Faculties is limited to eight configurations of mutually linked ‘Phases’ (see the Wheel), so that if one Faculty falls at Phase 4, the others will always be at Phases 12, 18 and 26, this makes it possible for the diagrams of the cones to be successively superimposed, ‘folded’ over upon themselves, with a single line cutting each cone at two points to denote the four Faculties. Ultimately, the most radical reduction, which Yeats does not use, since it obliterates the equality of the Tinctures, would show a single cone folded over on itself or, seen another way, half of the double cone. This is equivalent to one quarter of the Wheel, but able to stand for any quarter. Transformed further, to the most important form in the manuscripts, the diamond and hourglass, the path of each of the Faculties is made clearer, simplified to a single line, progressing with the increments in the Will from the far left. Since time is the linear dimension, the cones’ axes, the arrangement effectively allows us to appreciate the development of the Faculties’ interrelation through time, without any reversals or changes of direction. Since time is, however, for Yeats an illusion, the apparent linearity is false and belies the cyclical nature of the gyres. Such operations of doubling and rearrangement can seem to be mere exercises in variation, however each one represents a shift in perspective and in emphasis. Cones can be reflected and extended for one view or halved and collapsed for another view, as the perspective shifts, or to draw attention to a particular feature. However, the gyres or cones and the Wheel form the basis for all the subsequent variations and sophistications of thought; all the later formulations can be reduced to one or the other, ultimately of course to the gyre. Similarly each form can be taken to include within itself whole subsidiary cycles, such that, just as ‘The Great Wheel is . . . a single gyre of a great cone containing . . . twelve cycles of embodiment,’ so ‘Every gyre of every cone is . . . equal to an entire cone revolving through twenty-eight phases or their equivalent’ (AV A 139). 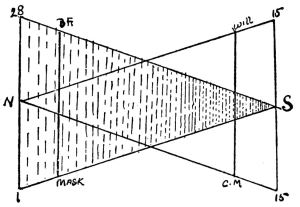 In many respects it may be that A Vision does not contain enough diagrams to expound the workings of the System as clearly as it might, and those that it does contain are often not particularly helpful: the diagram of the cones which prefaces ‘Dove or Swan’ (AV A ; AV B ) is not explained clearly and does not show Mask and Body of Fate at the correct positions, being a very atypical construction. Yeats indicates the need for the reader to be active: ‘There is much else that I must leave to my student, if such there be, to discover as he compares symbol with symbol’ (AV A 170) and Colin McDowell, one of the most perceptive and committed interpreters of A Vision, is probably right in stating that too few readers construct the diagrams themselves and therefore jettison an important aid to understanding. The essay "The Is and the Ought, the Knower and the Known: An Analysis of the Four Faculties in Yeats's System," by Rory Ryan, in the collection W. B. Yeats's "A Vision": Explications and Contexts, edited by Neil Mann, Matthew Gibson, and Claire Nally (Clemson University, 2012), provides further exploration of this topic.